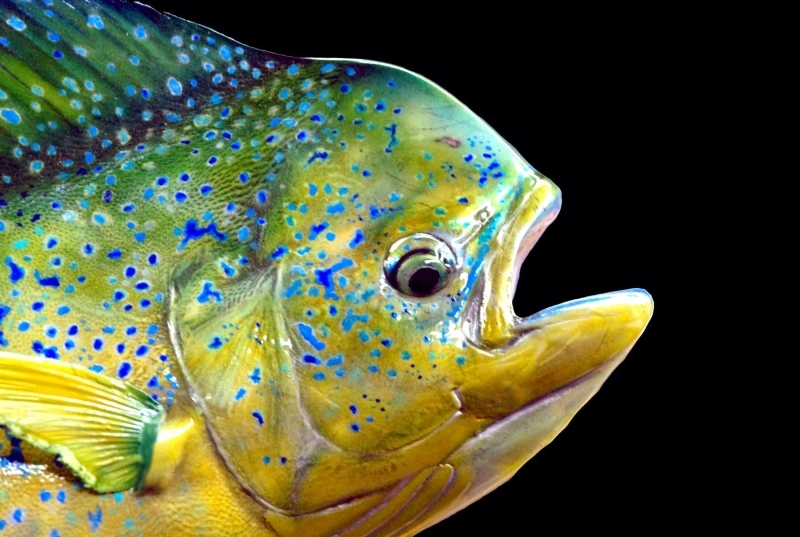 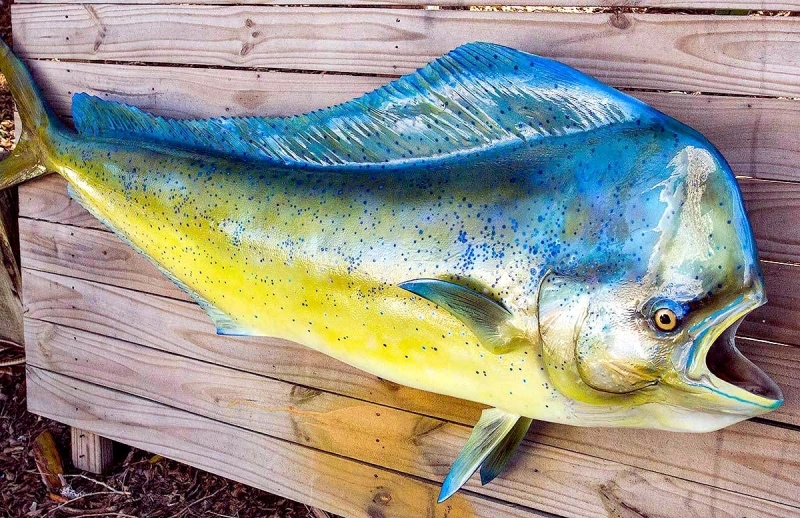 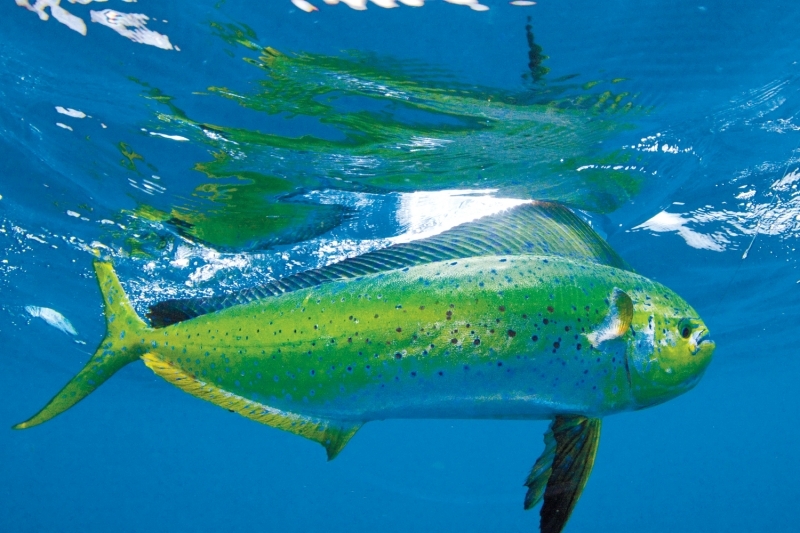 Considered by many to be the most beautiful fish in the sea, the Dolphinfish sports iridescent body colors with metallic blues & greens on the back and sides, with white & yellow underneath. 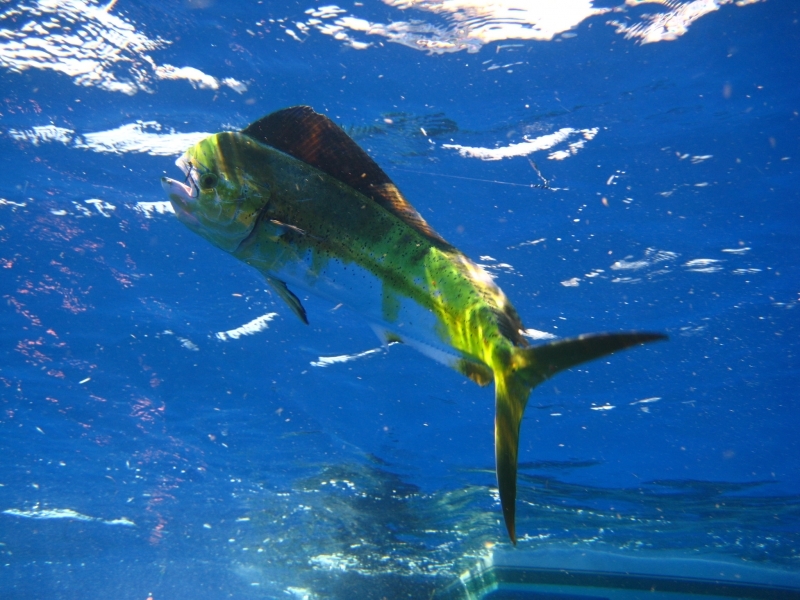 Many Dolphinfish have blue, green or black spots. 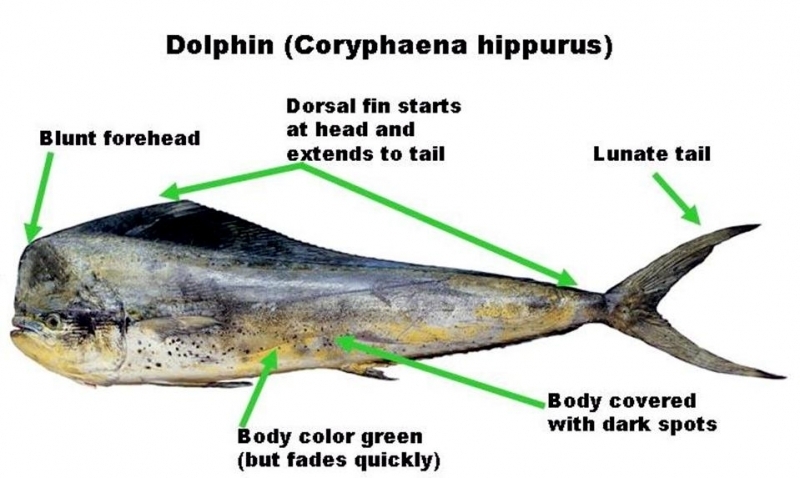 A Dolphinfish’s body is sleek and long, with a dorsal fin that extends from head to tail. 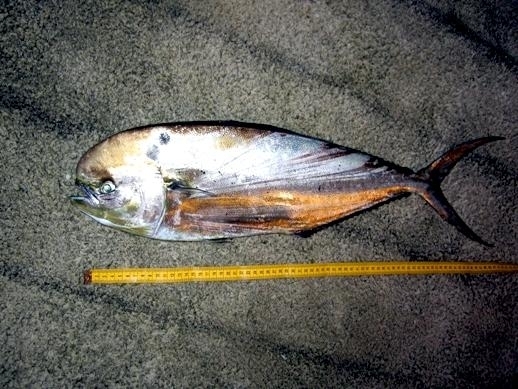 A mature male’s forehead is high and sloping; a mature female’s forehead is less steep. 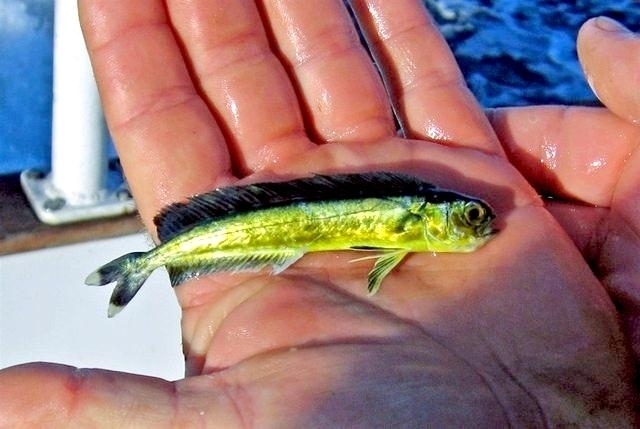 That lunate (forked) tail propels this fast-swimming fish to speeds of 40 mph. 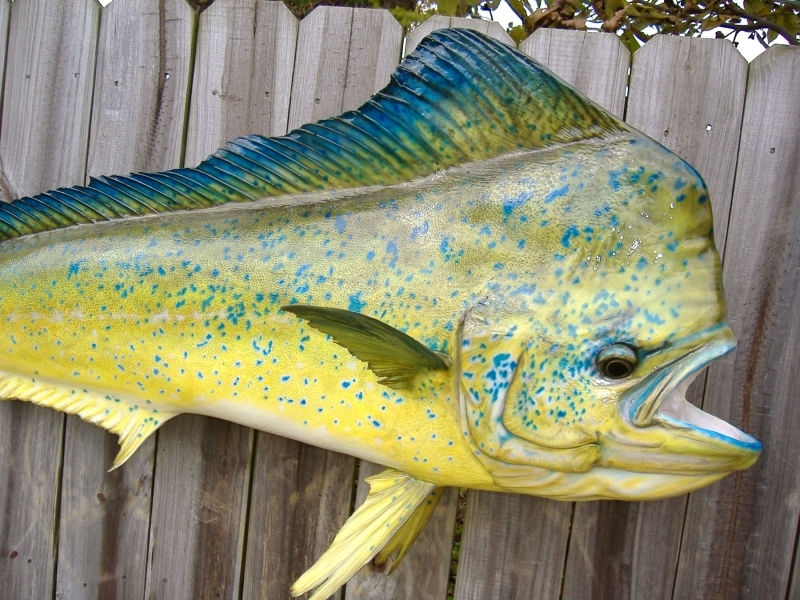 Dolphinfish is a popular menu item. 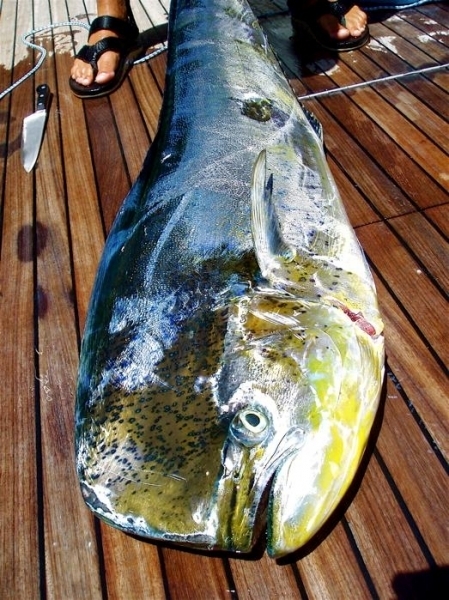 To distinguish it from dolphins (which are mammals), restaurants have popularized its Hawaiian name “Mahi Mahi”. 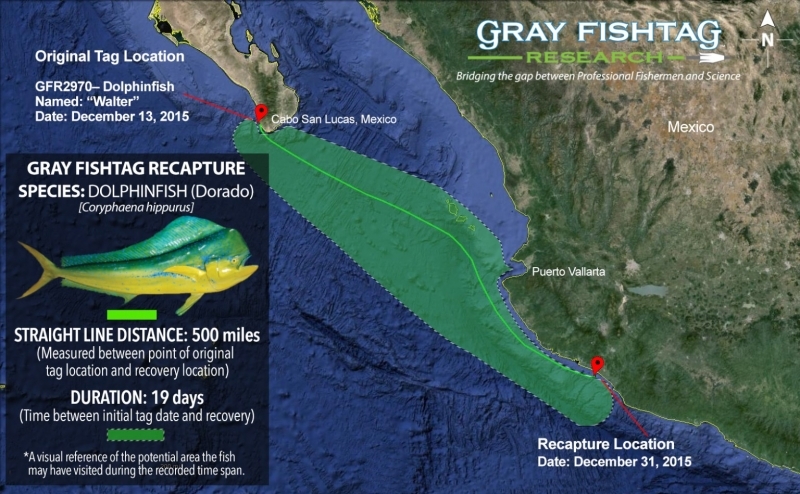 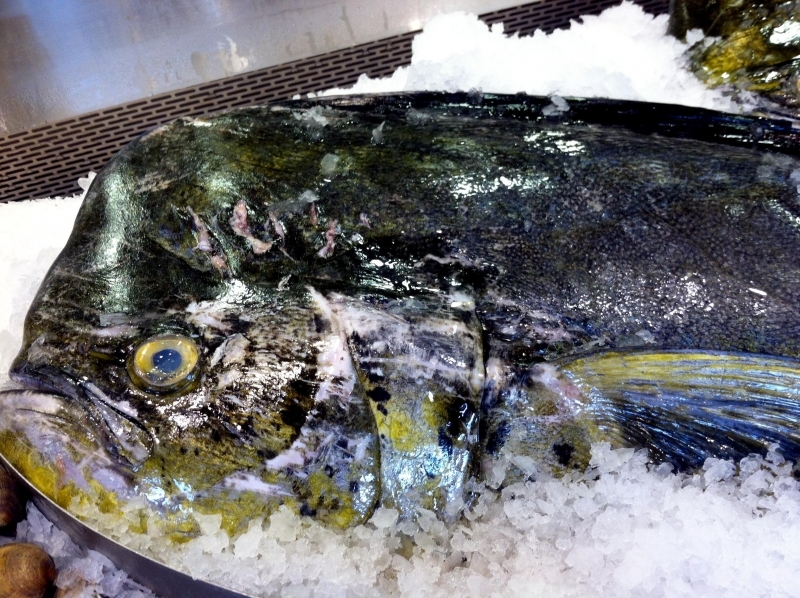 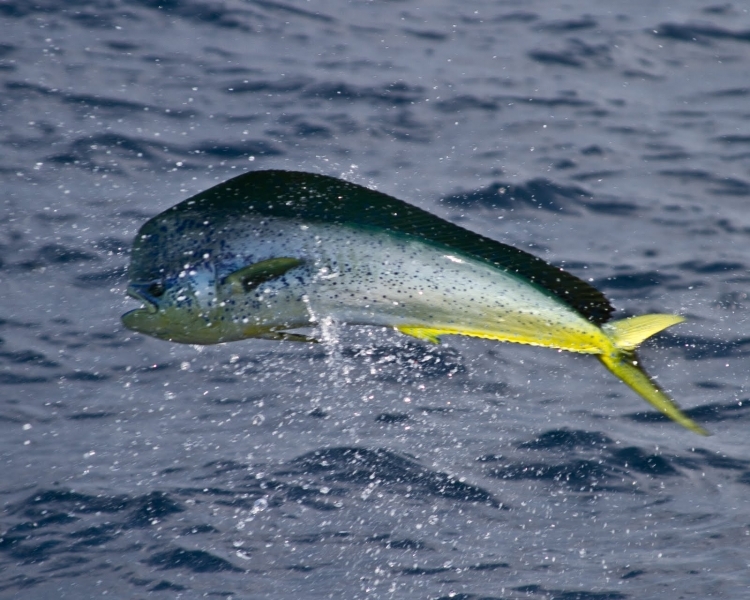 Mexican and Latin American regions call the Dolphinfish “Dorado”. 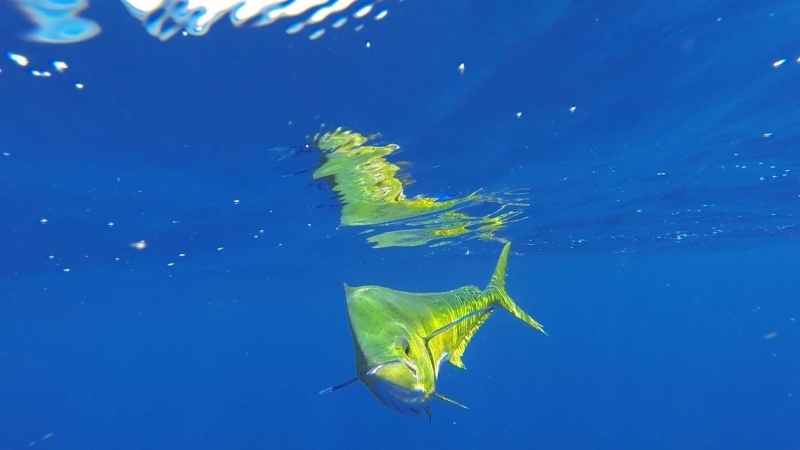 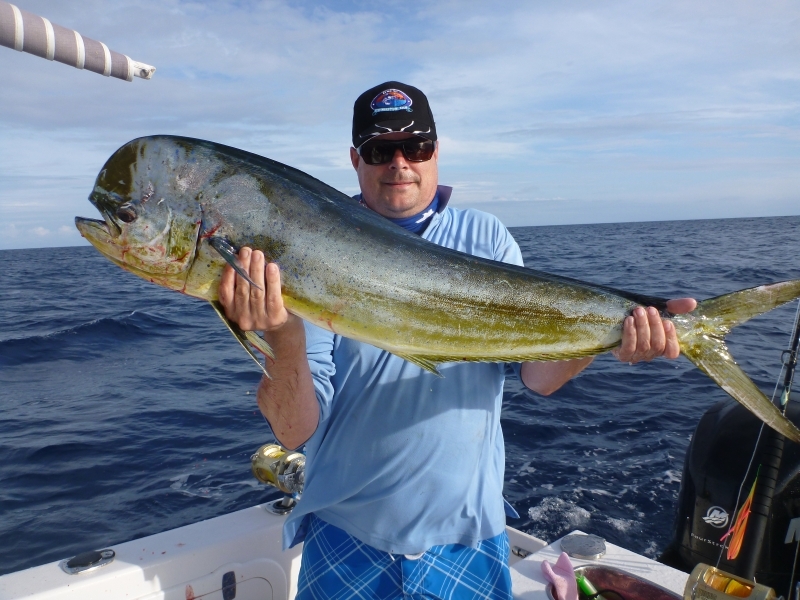 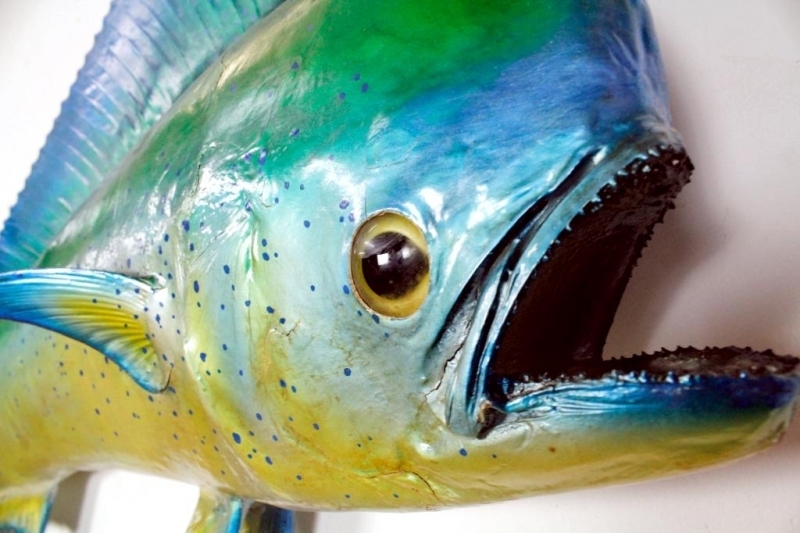 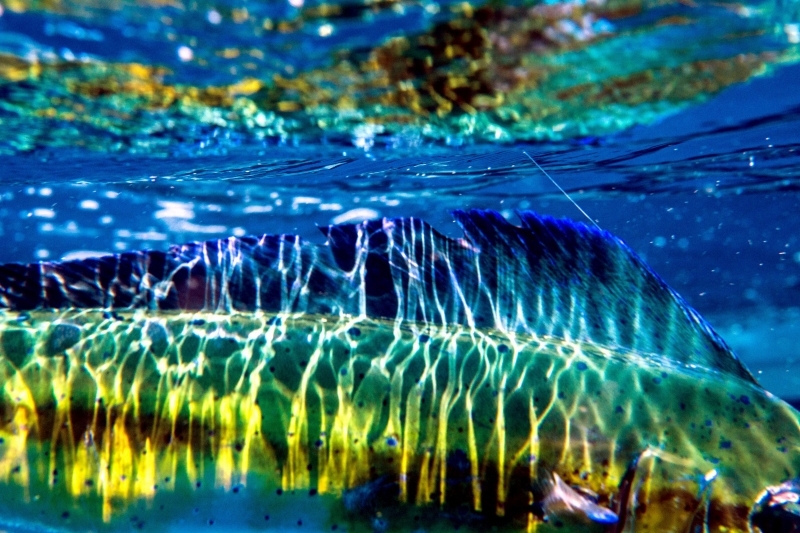 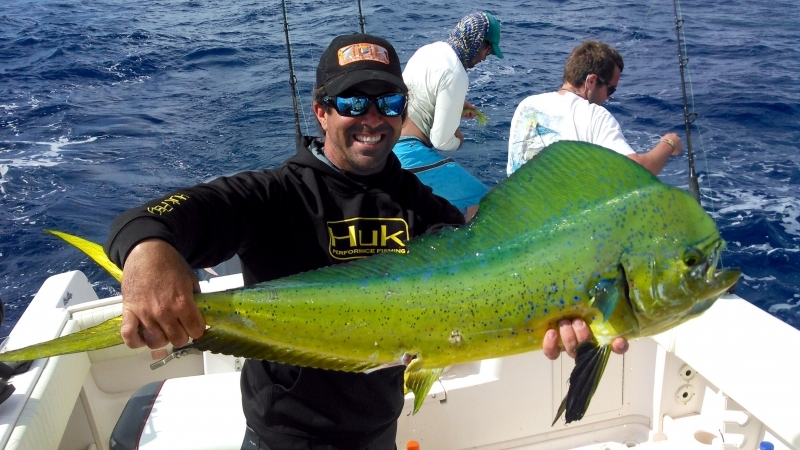 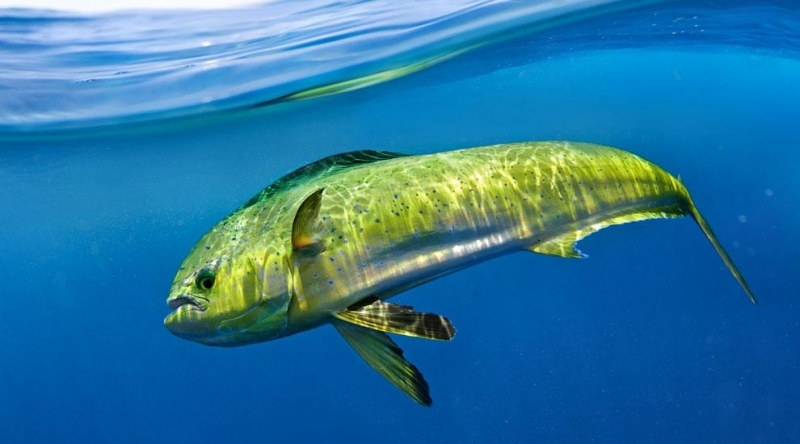 Dolphinfish are acrobatic, feisty fish, popular with recreational fishermen and are sought after by commercial fisheries, which often catch them on longlines. 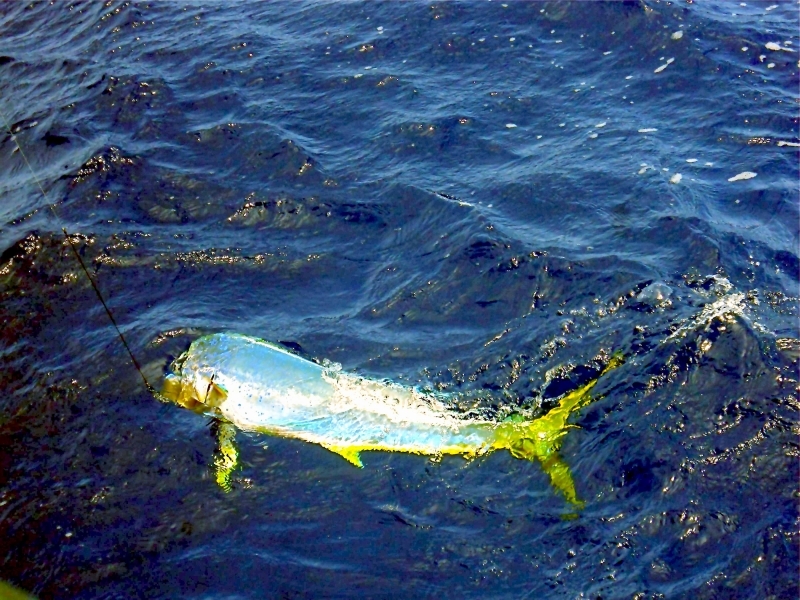 Longlines can be 20 to 69 miles (32 to 111 kilometers) long, with branch lines fitted with large hooks at each end. 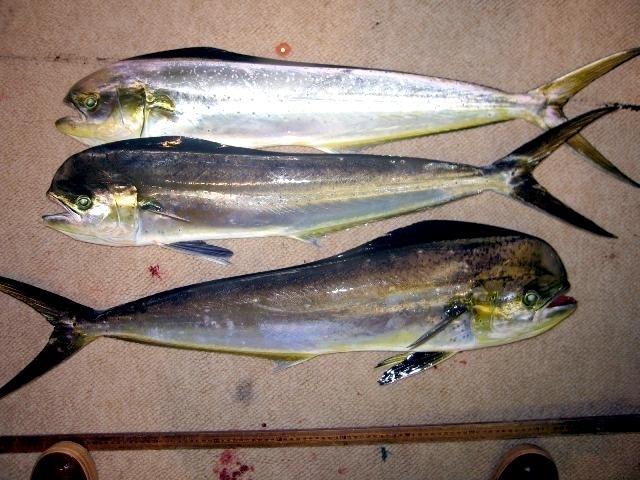 An average longline places 1,500 to 2,000 hooks in the water at the same time. 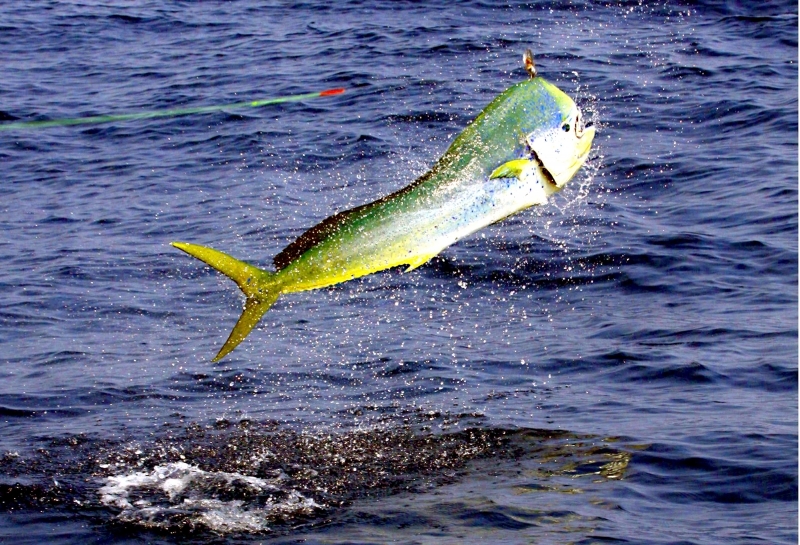 Unfortunately, longlines attract and kill many types of animals, including sea turtles, seabirds and sharks. 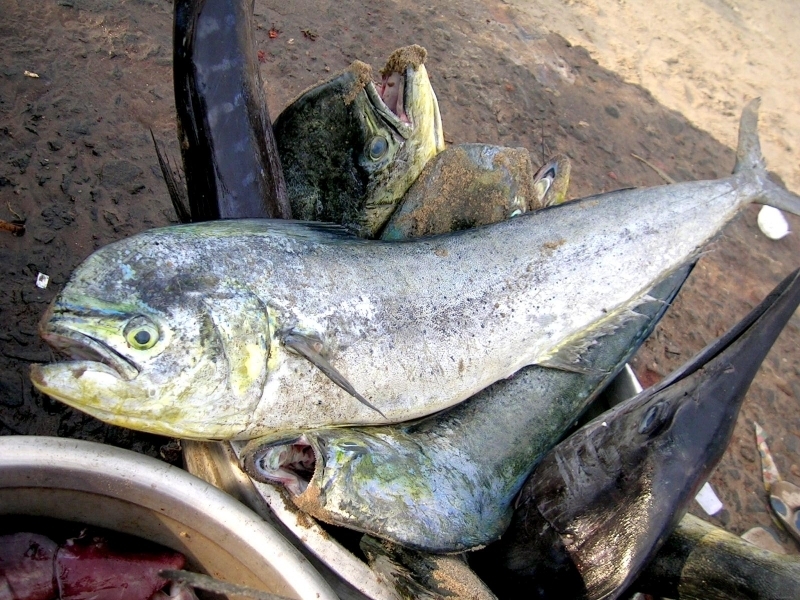 This “by-catch” of non-target species makes longlining a significant threat to ocean wildlife. 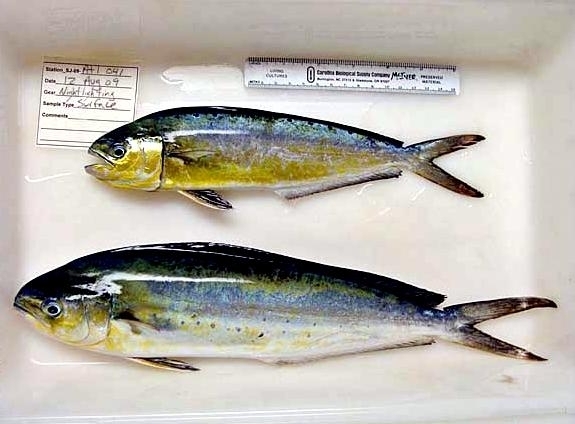 Dolphinfish have never had a scientific stock assessment. 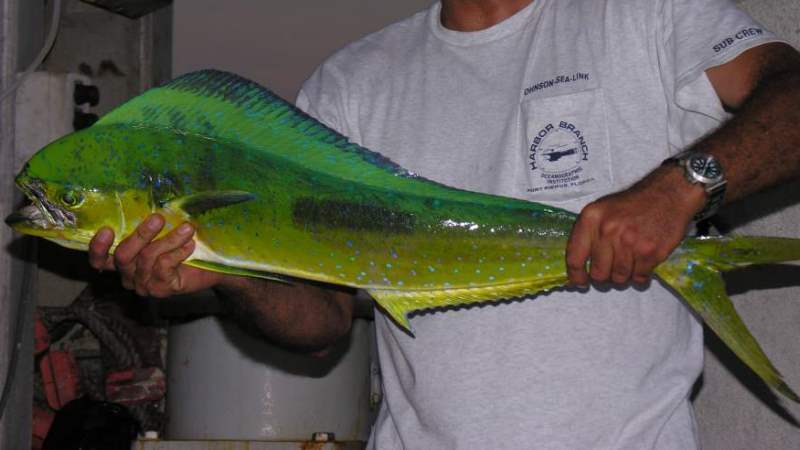 Hopefully, fishery research will show that this fish is abundant. 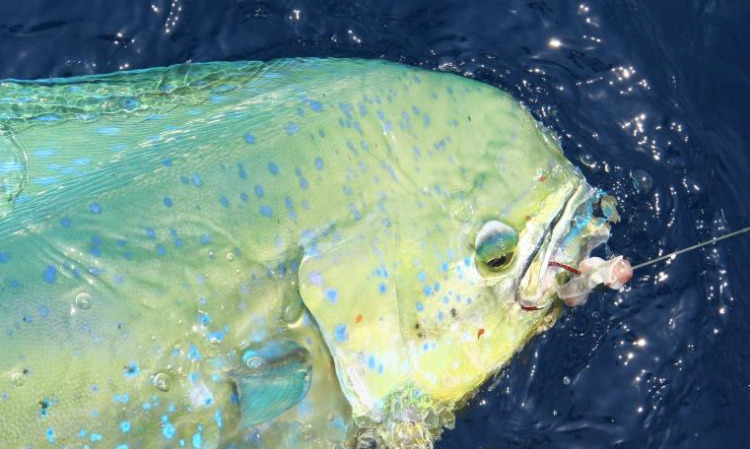 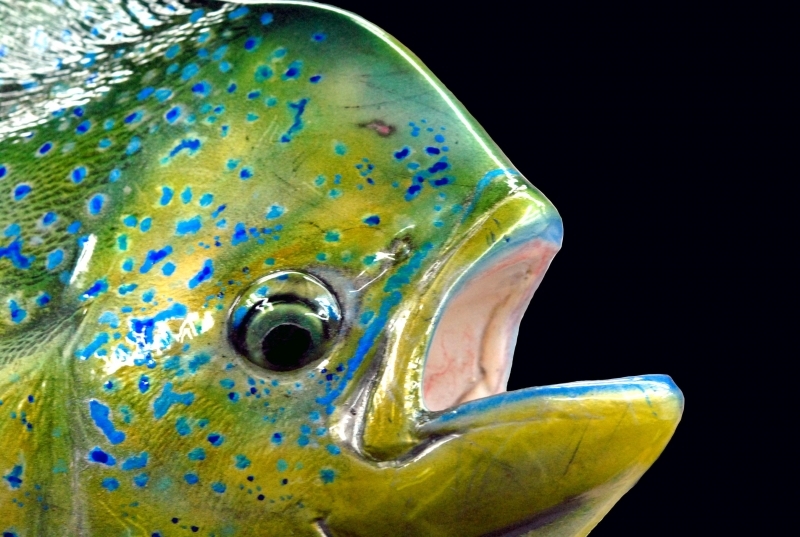 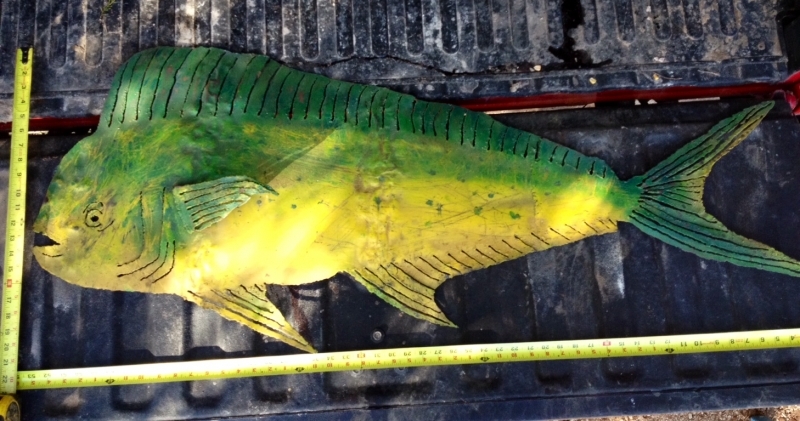 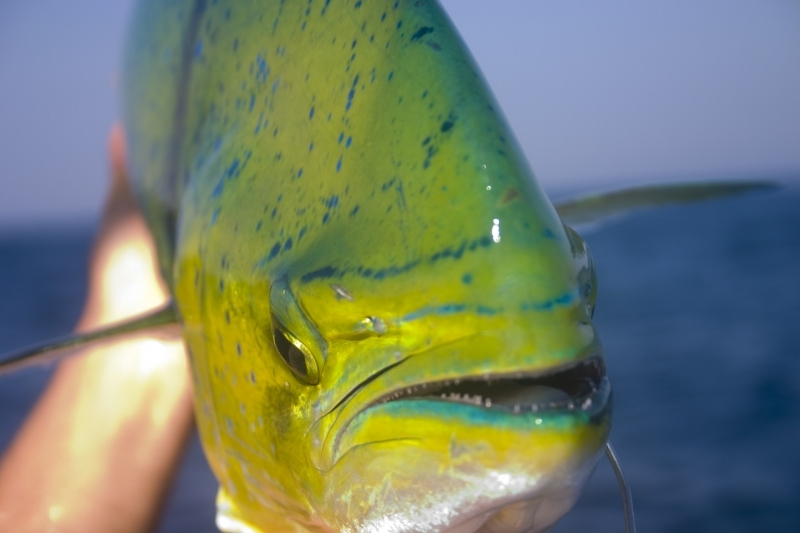 In the meantime, some state councils on the East Coast are regulating Dolphinfish catches. 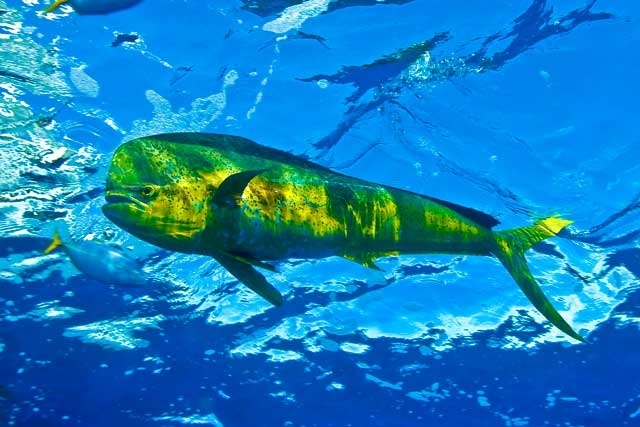 Dolphinfish live in the “fast lane” as they are a rapidly growing fish that can attain a length of over 4 feet in the first year of growth and up to 6.5 feet in four years. 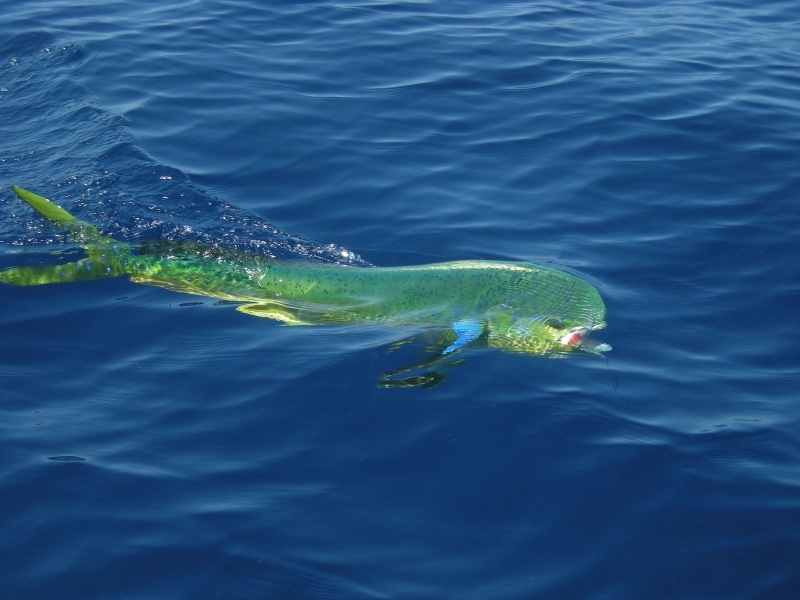 Juvenile Dolphinfish as well as several other species of pelagic fish are attracted to floating kelp mats, boats, sargassum, logs and debris. 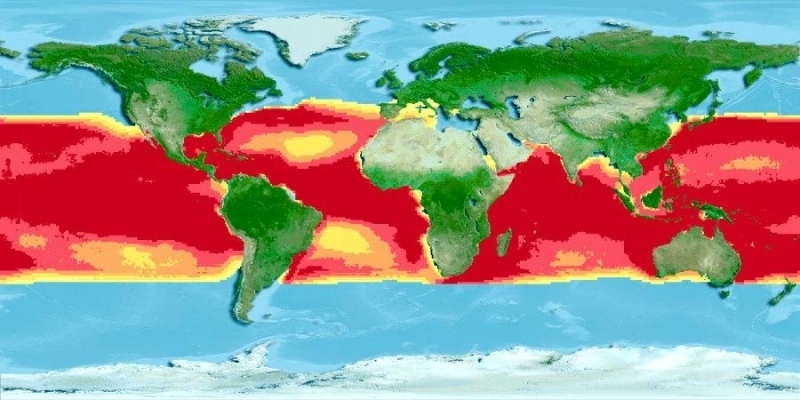 Since the floating objects don’t provide food or much protection, scientists aren’t sure why this is so.